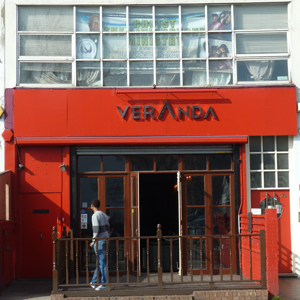 Veranda describes itself as a restaurant, cocktail bar and art gallery – and they are right. The entrance is a small hall (so people can be stopped if they are not invited) and the first part of the long room is the bar with small tables and some (but not much) comfortable seating. Most people cluster at the bar. At the back are the same small tables but now covered with white linen table cloths with white linen napkins. These tables are overlooked by the disc jockey who peers through an opening surrounded by a picture frame. In fact it took a couple of minutes to realise that this was not part of the art gallery on the surrounding walls. The gallery on our visit contained paintings – some predictable – red shimmering vistas and African images – but some very interesting photographs of people and landscapes. We usually talk about the food first but this is not in the rules and the cocktails are prolific and between 5 and 8 some are cheaper than usual (£4.50 vs £7.50)pm and luckily we arrived at 7.30. The cocktail list is actually a book. We didn’t count but there must be more than ten a page and down the margin there is a very helpful guide of how long the drink is using glass shapes. This alleviates the difficult task of trying to guess from the ingredients. We chose a rose and fresh lychee martini and a beer (hard to find at the back of the “book”). The martini was like a martini because of the shape of the glass and smelt very strongly of rose and tasted of lychee. It was also very pretty with a cherry at the bottom of the glass giving the cloudy liquid a rosy glow. I suspect it was very alcoholic (it also contains gin) – it is very difficult to tell in this alcopop. It was lovely but I doubt that I could drink too many because of the sweetness but there are lots more to choose from. For the food we would have had several of the things on the menu as there was gourmet oxtail, jerk chicken, 3 fish curry, curry goat, and more and more. We chose a plate to share starting with ackee and saltfish parcels. There were three of them (we were warned) – small packets of fried filo pastry. We liked them but the ackee was a bit lacking but the taste of saltfish came through and it was an easy way of eating them. Our plate was the Veranda Supreme which had curry goat and ital curry both in a crispy pastry basket and jerk chicken and Escovitch fish. This all came with rice and peas, coleslaw and fried golden plantain. The fish was hot and spicy – particularly the lavish chilli. The jerk chicken was soft and the sauce was hot but not too fierce. Altogether a good tasting choice but next time I will go for the goat curry. It was complexly flavoured and not too hot so all the flavours came through. Rice and peas — well what can go wrong. The plantain was sweet and had been made sweeter by a syrup. We did share but we didn’t manage to finish the plate. There were few desserts available – only one – apple and mango crumble. This was not like any crumble we have ever had. It was a hot and sweet sauce and covered with a biscuit crumb topping which arrived with a small portion of delicious ginger ice cream. But on the whole we wouldn’t order this again. The mango was completely lost and perhaps they should just stick to apple. The night we were there we were waiting for a famous visitor – Sir John Holt – who didn’t arrive while we were there but despite the preparation needed for this from the waiters they were still charming to us. We ate from the a la carte menu but if you book in advance you can eat a mid-week feast cheap (14.50 for two courses or 17.50 for three courses). Our meal was £25.00 per person including the drinks (a cocktail and three beers). We didn’t book but t was not that busy before about 8.15 – after that time you would need to book.